1 collage : b&w ; 18 x 22 in. Item is a collage of the Dalhousie Hockey Team. 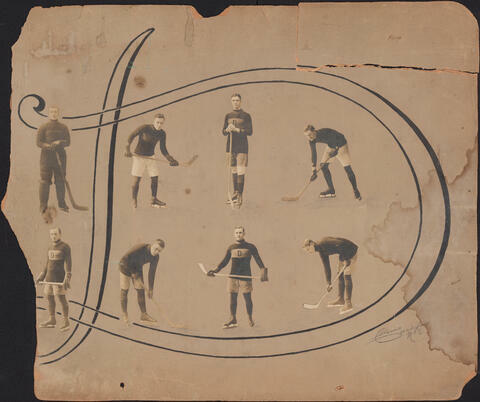 The collage consists of photographs of Norman E. McKay; W. R. Fraser; Gordon Richmond; Frank Graham; Douglas Graham; and W. L. Fraser posing with hockey sticks and arranged around a large letter "D". The left edge, upper edge, and lower right corner of the matboard are damaged. The upper right corner of the matboard is detached. A piece of lined paper containing the names of the team members is included with the item.